It has been around a year since I have first bought and tried out the Vibram Five Fingers KSO for many purposes. I then stopped wearing them about 6 months ago to test out many other varieties of shoes and just recently started wearing them again and I did miss them a bit. In this review I want to first talk about what I have been using the KSO’s and what I felt about them after this extended period of use including benefits and draw backs. After wearing the KSO’s consistently, I felt that my legs were stronger and tighter around the calf region. Although anybody who runs and exercises regularly may experience stronger legs, I noticed the KSO’s allowed you to work them out a bit more that usual. You can notice this difference in strength when you switch from Vibram Five Fingers to regular shoes. As expected, I was made more aware of where I stepped and how I landed when I ran OR walked. Because of this I feel that wearing the Vibram Five Fingers shoes would help people become less “clumsy”. I still enjoy the general attention the FiveFingers brings when you just wear them out casually. It also allows you to introduce the concept of barefoot running and the shoes that help you gain similar benefits. My running style is more refined and in tune to what I needed to reduce pains that I would get when I just ran with no thought of foot/heel strike and where I landed. This benefits would be one of the higher rated benefits of wearing these barefoot shoes. After wearing them for a while, I noticed that they are quite durable and they don’t look like a pair of dirty old sneakers even with heavy use. If you don’t wear them for extended periods of time, you will be sore and you have to ease into them again. Getting calluses and more dead skin is still common after extended use of the KSO’s. The five finger socks that I wear with these shoes make them a bit uncomfortable. Maybe a solution would be to get a larger size. The KSO’s are great, I really enjoy wearing them and exercising in them. The drawbacks are few and the benefits are great. I’ve tried the sprints and classics and think the KSO’s are by far my favorite. 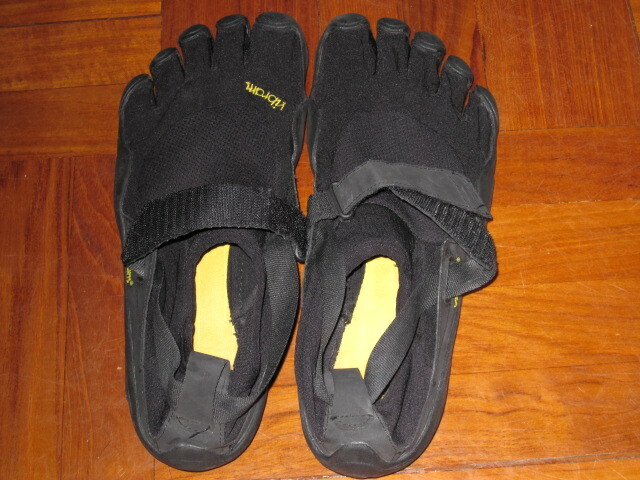 The next Five Fingers Shoe I definitely have to test out are the Vibram Five Finger Bikilas. I am a +1 handicap golfer and walk at least 18 holes daily. I started to experience a lot of toe pain in my pinky toes on both feet. Thank God I found these shoes and Injinji toe socks. I now play every round including tournament round in either my KSO treks or my Sprints. These shoes are amazing for balance and feel of the turf. They also help my read the greens with my feet because I can feel the subtle grade changes and slopes of the green with my feet. I suggest anyone will play better golf in these shoes. Sam Snead always played better in bare feet so who am I to question it. @Lee, You know, I never thought about using Vibram FiveFingers to play golf in…but now that you mention it it sounds like a great idea! I love walking on grass with the FiveFingers (since it’s not as hard as concrete). If you are looking for something even more interesting you can try vibram fivefinger tennis…wouldn’t recommend it for everyone, but it’s definitely an experience. Previous post: Vibram Bikilas In Stock-Order Before They Run Out!